Chapelhouse Reservoir is a water reservoir near Uldale in Cumbria. The reservoir, which is around 435 meters long, was built by John Laing & Son in around 1900. 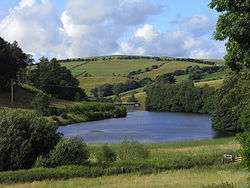 It involved damming the River Ellen above Uldale to provide water for Aspatria and Silloth. It is named after Chapelhouse Farm which is close by and it is owned by United Utilities. ↑ "Chapelhouse Reservoir". Lakes, meres, tarns & waters. Retrieved 12 September 2015.